First stop, Germany! After a long flight from Los Angeles to Sweden and then Sweden to Berlin, I was finally in Germany. I slept like a baby at my step-brothers loft in Berlin and headed straight to Munich for the weekend first thing in the morning. I usually travel decently comfortably since I am able to split costs with friends – but since I am traveling alone, I’m definitely taking budget to an extreme. I arranged a ride share to drive from Berlin to Munich for only 30€. Seeing as how trains, buses, and flights were anywhere from 100-300€, this was absolutely awesome. We cruised down the speed-limitless autobahn at an average of 100mph, with the exception of a couple spurts of 150mph. Being a bit of a speed demon, this was a great way to start my weekend. I was dropped off at a local train station and found my way to the Airbnb I had rented, another great service while traveling! There, I met my step-sister and friends, all donning full Bavarian attire. We initially planned to see more of the city, but with Oktoberfest running all day everyday, it was hard to pass up. Clearly our priorities were in perfect order. 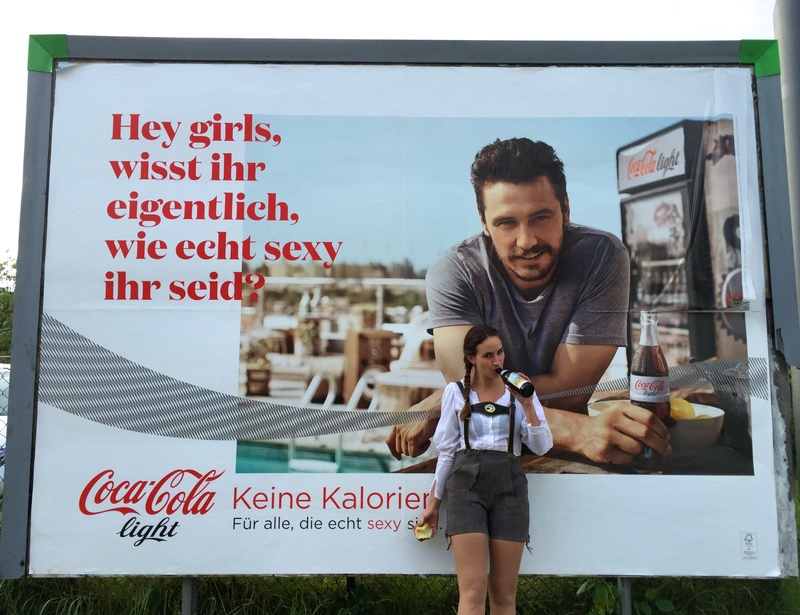 Typically, women wear dirndls and men wear lederhosen… but my mother owns an authentic pair of lederhosen, so I rocked the suede overalls instead. 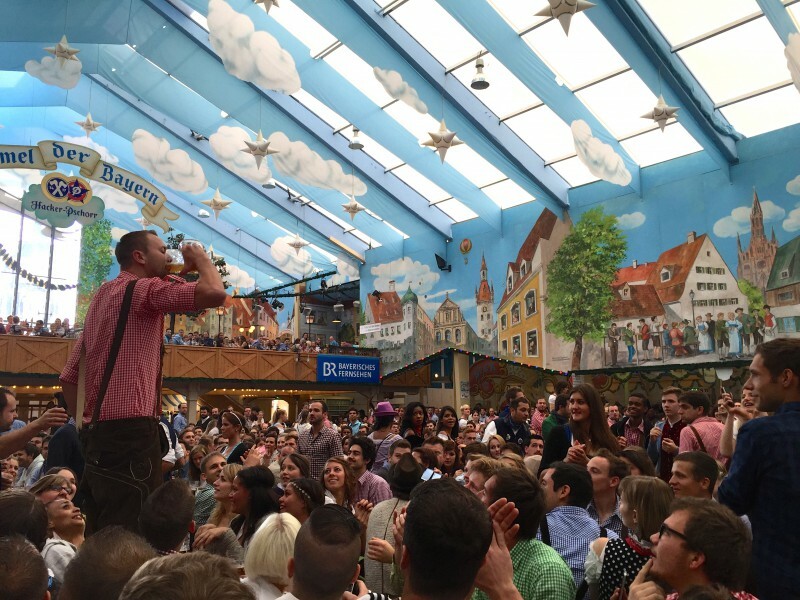 We made our way to Oktoberfest that evening and went straight to the Hofbräu tent. We grabbed a table in the Biergarten and ordered a round of beers, or “Mass”, containing a full litre of beer each. The following evening involved a lot of dancing, a ton of singing, gigantic pretzels, and some incredibly embarrassing (but awesome) videos. After we stumbled out, we had equally as much fun outside of the tent as we did inside. We ran across the festival grounds to find some more food and proceeded to stuff our faces with authentic, hearty food. Fat and happy, we passed by some bumper cars and decided it would be a great idea to jump into moving bumper cars with random passengers. In beautiful unison, the driver and I cheered for no apparent reason and continued to slam into fellow drunk drivers. After a quick night out, we headed back to the apartment to prepare for our next big day ahead. 6am is never an ok time to wake up, unless it’s for beer. A little disoriented, we all grabbed our bavarian outfits and headed to Day Two of Oktoberfest. Hacker-Pschorr is considered one of the best (if not the best) tents to go to, so we knew we needed to get there early if we ever expected to find a seat. We arrived early enough to basically get straight into the Biergarten, but the tent was a whole other mission. We eventually got inside and squeezed our way into a table with some Dutch travelers. At first they weren’t too happy to share the table with us, since God forbid you’re a bunch of dudes and five ladies want to sit with you, but after they warmed up to us – we all had a great time. 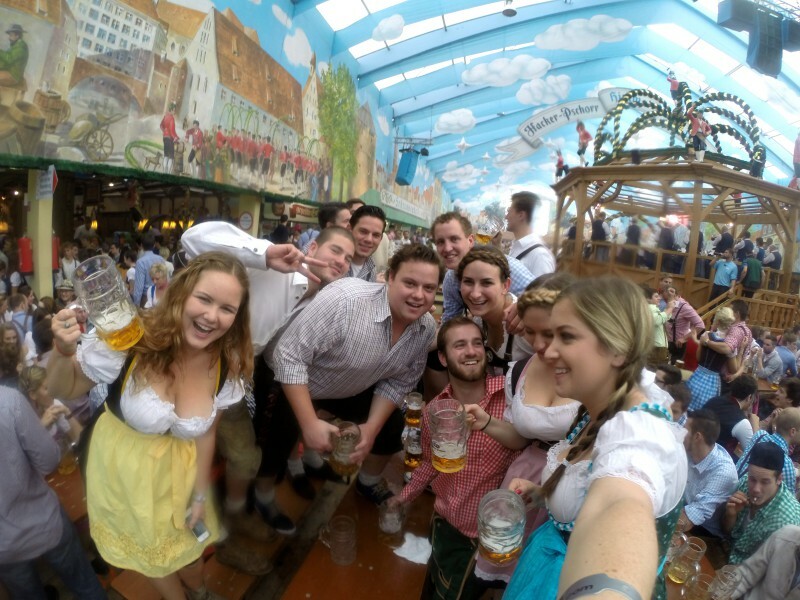 These guys weren’t rookies, every single year they all come to Oktoberfest, so they were drinking heavily. Little ol’ me tried to keep up, but after four litres of beer, I decided that I would just dance and eat some more giant pretzels. I brought my GoPro for the second day and I’m pretty sure I could win an Oscar for the footage I captured. Oktoberfest is a beautiful adventure, and regardless of what nationality you are, everyone can agree on one thing – beer is amazing. The next day was rough to say the least. We all slowly rolled out of bed and unfortunately went our separate ways (ci vediamo tutti presto!) I decided to walk around and try to see as much of Munich as possible before I had to leave. I strolled around Marienplatz and walked up and down the cobblestone roads before meeting my ride share to head back to Berlin. After an amazing weekend of debauchery, I have to say, Oktoberfest is truly the greatest festival ever.